This is the quarter-scale model for The Expanding Universe (Man and the Expanding Universe Fountain) located in the South Court of the United States State Department Building in Washington, D.C. The fountain was erected to celebrate the nation's first exploration of outer space. The monumental central figure suggests a superhuman mythological being. He is seated upon a ten-foot sphere, encrusted with a multitude of stars of various magnitudes set in a pattern of the bright-star constellations of the celestial system. In his hands, he holds two planets that he is sending off into space. His hair, designed with jagged lightning-like forms, is studded with clusters of multi-pointed stars. The dynamic spiral orbit-form swirling around the sphere represents the speed and perpetual movement of the heavenly bodies in space. Play of the water in a spiral pattern from numerous star-shaped sprays is intended to increase the feeling of movement upon the figure, sphere, and orbit. The basin of the fountain is lined with colored glass mosaic tiles. The central figure and sphere are cast in bronze while the orbit, planets, water spouts, and the stars in the hair and on the surface of the sphere are of nickel alloy. According to Fredericks, the sculpture "represents this age of great interest, exploration and discovery in outer space...[and] the immensity, order and mystery of the universe." Man and Expanding Universe, Washington, D.C.
72" x 48" x 58"
"The theme was selected to represent this age of great interest, exploration and discovery in outer space. The complete concept is intended to symbolize the vitality, order and mystery of the universe. The monumental central figure suggests a superhuman mythological being. He is seated upon a ten-foot sphere, encrusted with a multitude of stars of various magnitudes set in a pattern of the principal constellations of the celestial system. In his hands he holds two planets, which he is sending off into space. His hair, designed with jagged lightning-like forms, is studded with clusters of multi-pointed stars. The dynamic spiral orbit form swirling around the sphere represents the speed and perpetual movement of the heavenly bodies in space. Play of the water from numerous star-shaped sprays in a spiral pattern upon the figure, sphere, and orbit is intended to increase the feeling of movement." "There are thousands of star forms in seven magnitudes all in their proper position in accordance with the celestial pattern." How does MF give you the impression of a revolving globe when this sculpture is perfectly still? By placing this spiral form around the globe he is giving you the impression of a revolving globe. Since it does that it's considered the 4th dimension which is time. The 4th dimensions characteristics are, actual movement, implied movement, or a progression of things to indicate time, the 4th dimension. The next piece is titled "The Man and the Expanding Universe Fountain," and this is just the quarter scale and this is located at the State Department building in Washington, DC, in the courtyard of the State Department building. It was dedicated for our first exploration into space. The figure is casting out into orbit, two planets, and then the figure that he is on has 5,000 stars, all in their correct celestial positions; all the constellations, in their relationship to each other are all laid out, and then you have the orbiting projectile going around this sphere and you really get the feel of movement. It is a fountain, even the nozzle-heads where for the water sprays are shaped in stars and the fountain has mosaic, colored tile on the bottom of the fountain, and you really do get the feeling of motion, of movement. This was dedicated in 1964. 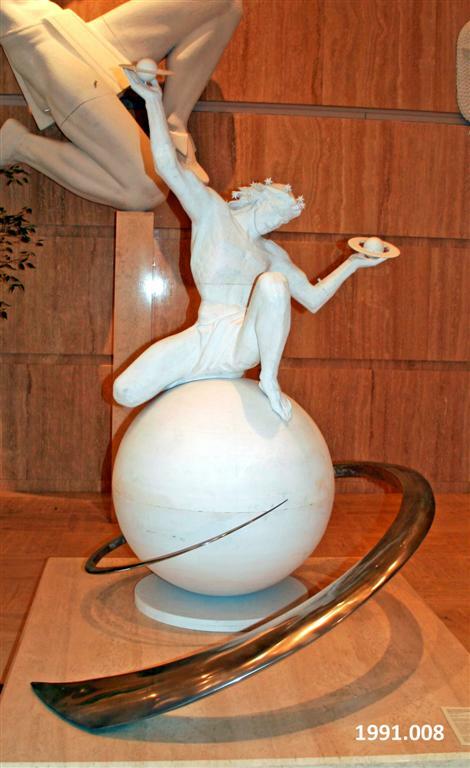 The figure and the sphere are cast in bronze, the planets that he is casting out and the orbiting projectile were cast in nickel. The figure is four-times this size. Sometimes on the national news, you have the correspondent, or the reporter, on the T.V., that is, right there in front of the flags that are there at the State department, and sometimes, between the flags, you can get a glimpse of the fountain. 50 years ago, the National Aeronautics and Space Administration, or NASA, began. Since then, NASA has changed the way we look at our world and millions of other worlds out there in space. On Oct. 4, 1957, the Soviet Union launched a satellite, Sputnik, into space. This was the first time people had sent an object to orbit the Earth. A month later, the Soviets launched Sputnik II. This time, they sent a dog into space aboard the satellite. The Soviet space launch took most people by surprise. At that time, many people feared the Soviet Union. Some were afraid that Sputnik showed the Soviets were more advanced than Americans in science. When the Soviets launched Sputnik I, they launched the Space Age. Few had seen that coming. From 1957 to 1958, 60 countries, including the United States and the Soviet Union, were part of a partnership to learn more about the Earth. This year-long project was called the International Geophysical Year. Most of the Earth-study projects were done on Earth. But the Soviets decided to study the Earth from space. The Americans had been working on a satellite too, but they weren't in any hurry. After the Soviets launched Sputnik, America scrambled to catch up. In January 1958 the U.S. launched it's first spacecraft, Explorer I. America had no agency to oversee its space ventures. Explorer I was launched by the U.S. Army, using knowledge gained from WW II. In March 1958, the U.S. Navy launched its own satellite, Vanguard I. It was the first solar-powered satellite. Government officials had a long debate over whether the U.S. space program should be run by the military or by civilians, or ordinary citizens. Scientists predicted peaceful	benefits that people could only dram about in 1958, such as long-term weather forecasts and worldwide radio communications. The scientists convinced the government to make NASA a civilian agency. Almost a year to the day after the first Sputnik was launched, on Oct. 1, 1958, the United States created NASA. NASA took over several other agencies, including NACA (National Advisory Committee for Aeronautics). NACA'a job had been to study airplane flight. NASA also took over Army and Navy missile and flight labs. In April 1961 the Soviet Union sent the first person into space, Yuri Gagarin. Within a month, President John F. Kennedy had promised to send Americans to the moon. On July 20, 1969, Neil Armstrong became the first human to walk on another world. Buzz Aldrin was the second. As he stepped onto the moon's surface, Armstrong said, "That's one small step for man, one giant leap for mankind." Only 12 men have walked on the moon. The Apollo moon program ended in 1972. Today, NASA is making plans to return to the moon and set up a base station there. NASA has launched many probes to study the objects in our solar system. The two Voyager spacecraft, launched in 1977, changed the way we look at our solar system. The Voyagers were designed to last for 5 years. Today, 30 years later, they are still sending back data. Voyager 2 has actually left the solar system. It is the first time a human-made object has left our system. Voyager 1 will reach the edge of our solar system in another 10-20 years. The Voyagers could keep traveling forever. The Hubble Space Telescope and other space observatories have given the world a better view of our place in the universe. For example, because of Hubble, we now know the universe is about 13.7 billion years old. Some of the most exciting probes have been the rovers that NASA has sent to Mars. Because the rovers are searching for signs of life, they attract a lot of interest. 16 countries, including America, Russia, Canada, Japan, and many European nations are working together on the Internationsl Space Station. NASA works to make air flight safer and faster. It is working toward the development of advanced aircraft. NASA's research has led to benefits such as cell phones and health aids such as heart pacemakers. Satellites send data about changes in our environment. Weather forecasting of hurricanes comes from NASA satellite technology. Fredericks, Marshall M., 1908-1998, “The Expanding Universe [Plaster],” Marshall M. Fredericks Sculpture Museum, accessed April 22, 2019, http://omeka.svsu.edu/items/show/5057.